The first article in this two-part series presented techniques that are being evaluated during flight trials as part of Germany’s UniTaS IV project, a cooperative endeavor bringing together academic and industrial researchers. This second part of the series concentrates on the question of signal authentication for safety-of-life applications, as well as ground-based activities and theoretical investigations concerning aspects of the new Galileo signals and multi-constellation GNSS. As part of this discussion, we will also present a short overview of the aviationGATE test infrastructure, built as part of the UniTaS IV project. The threat of GNSS spoofing — the transmission of false signals — has grown more acute in recent years. Accordingly, a variety of signal authentication schemes have been proposed as a response to GNSS spoofers, including server-based authentication and multi-antenna systems. As part of the UniTaS IV project, and in the context of aviation services, we studied spoofing and signal authentication, particularly authentication schemes for ground-based and space-based augmentation systems (GBAS and SBAS). For GBAS systems, users of VHF data links are not interested in authentic signals per se, but rather in authentic correction and integrity data. Thus, the VHF data link is canonically applicable for digital signature systems. The project defined a new message type for navigation message authentication (NMA) together with a signing and verifying procedure based on the Rivest-Shamir-Adleman public-key algorithm in the Digital Signal Standard (RSA-DSS). For SBAS systems, we propose to secure correction and integrity data using digital signature systems in a similar manner as GBAS systems. Due to the lower data bandwidth and the smaller frame size, new message types and new signing and verifying procedures were defined based on the Digital Signal Algorithm (DSA) promulgated by the U.S. National Institute of Standards and Technology. Because SBAS satellites are using signal relay techniques, SBAS would be an interesting platform for testing new authenticable signals. Newly designed NMA schemes with additional asymmetric or symmetric spreading code authentication have been developed. Even the use of only one comparatively strongly authenticable signal could assist other NMA-protected signals due to its capability of securely estimating the receiver clock bias at the roughly known user position. One important assumption for spoofing detection algorithms in aviation is that potential attackers do not have physical access to the RF input of the receiver’s front end. As a direct consequence, the authentic signal remains present in the captured signal, even if the spoofer was able to take over the tracking loops. The visibility of the authentic signal during a spoofing attack mainly depends on the amount of additional noise induced by the attack. The noise level at the input of the analog-to-digital converter (ADC) of a GNSS receiver will be kept constant by the automated gain control (AGC), resulting in a lower amplification or in higher attenuation with a fixed amplifier, respectively. We can use the control voltage of the AGC to monitor the jamming component (additional noise used to mask the authentic signal) of a suspected spoofing attack. However, this monitoring alone cannot distinguish among unintentional interference, intentional jamming, or an actual spoofing attack. We can accomplish this by searching the received signal for multiple appearances of the monitored signal. Erroneous signal generation induces errors on range measurements and thus signals must be monitored to ensure precise and secure applications. Erroneous signal generation is commonly described as a combination of errors in the digital and analog parts of the signal. Digital errors result in a lead/lag at falling/rising chip transitions, and analog errors are characterized by some second-order ringing of the generated signal. Digital errors are referred as threat model A (TMA), where the model parameter denotes the lead or lag of the chip transition. Analog errors are referred as threat model B (TMB), where the model parameters are given in the damped natural frequency and the damping factor of the second order filter. A combination of digital and analog errors is denoted as threat model C (TMC). Within the UniTaS IV project, the applicability of the threat models was assessed for the Galileo signals. For all binary offset carrier (BOC) modulations, both possibilities of digital errors occurring on chip- and subchip transitions were assessed. 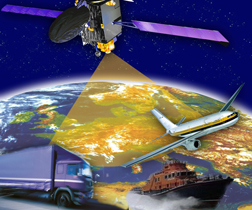 In the current GNSS scenario with new services and systems coming on line, the possibilities for optimizing the navigation solution in terms of availability, continuity, integrity and accuracy are steadily increasing. Accordingly, the interest in using Receiver Autonomous Integrity Monitoring (RAIM) techniques is also growing, especially because different navigation systems can be combined to provide the user with a powerful integrity service. Within the UniTaS IV Project GPS/Galileo RAIM techniques for detecting multiple satellite failures have been developed. The UniTaS IV Project’s main goal was both to analyze the performance of current RAIM techniques and to propose new integrity techniques for combined GPS/ Galileo observations in a scenario with multiple simultaneous satellite failures. Our analysis focused on a combination of a weighted least squares method (LSQ) using range measurements from two different satellite systems, as well as on the assurance of integrity by an observation of the remaining error vector of the least squares adjustment. The use of space projections and satellite motion helps to formulate a model for detecting for multiple simultaneous satellite errors. The current status of Galileo having only two satellites (Giove A, Giove B) is not sufficient to test applications for aviation based on the European GNSS system alone. However, the full implementation of Galileo promises progress in safety-critical applications and technologies as developed within UniTaS IV. To be able to verify these before the system is completed, a test range called aviationGATE is being set up at the research airport in Braunschweig. The mode of operation for aviationGATE is based on pseudolite principles. Satellites are rebuilt as ground based stations to send out real satellite signals equivalent to those of the future Galileo system. With these signals, a user receiver can determine its distance to each of the pseudolites and, consequently, the position solution. The pseudolites will transmit on three Galileo frequencies, namely E1, E5a and E5b, making precise positioning available with the aviationGATE air space. In this two-part series, we have presented an overview of topics covered by the UniTaS IV Project, stemming from a successful cooperation between academia and industry to demonstrate the use of future GNSS and complementary navigation technologies. Beyond pure scientific research, the project results demonstrate the relevance of the developed algorithms and methods for future applications. For further information, please contact the authors. The presented results are developed during the IFF’s UniTaS IV project founded by the Bundesministerium für Wirtschaft und Technologie (BMWi) administered by the Agency of Aeronautics of the DLR in Bonn (FKZ 50 NA 0734). The IFF wants to thank all UniTaS IV scientific and industrial partners for the good cooperation and the excellent work performed during the UniTaS IV projects. Humphreys, T., and B. Ledvina, M. Psiaki, B. O’Hanlon, B., and P.
 Lo, S., and D. De Lorenzo, P. Enge, D. Akos, and P. Bradley, P.